Designed to amplify the natural characteristics of bass instruments, Thunderfunk amplifiers are becoming the choice of the world's best bassists. Founded by electronics designer Dave Funk, Thunderfunk Amplification manufactures one of the most versatile, lightweight, and powerful tube bass amplifiers currently being produced. Thunderfunk's newest model, the TFB750A, is constructed of an aluminum chassis that weighs only 21 lbs., and it can be utilized as a fully integrated amplifier, DI, preamp, or power amplifier. Among its numerous components are a built-in limiter, 4-band semi-parametric equalizer, enhance and timbre controls for tone sculpting, "the switch," and a cooling fan that can be left on or turned off for quiet operation. In addition to building amps for the working bassist, Funk is also the author of a tube amp workbook which is recognized as a standard reference guide for collectors, owners, and technicians of vintage Fender tube guitar amplifiers. In this interview, Dave Funk talks about his background as an electronics designer, starting his own amplification company, and the features included on the latest generation of Thunderfunk amps, the TFB750-A. What led to the creation of Thunderfunk Amplification? I was raised in Elmhurst, Illinois, a suburb of Chicago. When I joined my second band in 1965, all of the other musicians had Fender amps, and I thought they were beautiful. I bought my first Fender Bassman amp in 1968, but I was disappointed with its performance. By the time the 1970's rolled around, the buzz was Fender tweed amps which had just started to go up in price. Not able to afford one and not knowing which one was the best, I started looking over the Fender schematics I had collected from working in music stores and picked one out to build. My amp was noisy as hell, and it was never more than an experimental chassis. In doing the research for this amp, I saw some interesting circuits in the stack of schematics and my hunches were confirmed when I was able to buy an old Fender Bassman amp. I started to use these circuits in modifying the black-faced Showman amp I had at that time. This would have been in 1977, and I still have this amp today. You might say it is Thunderfunk serial #1. I became an electronics designer for Lowrey Organ which was owned by Norlin-Gibson/Moog, and then later I worked for Motorola. This led to 30 years of contracts designing everything from the detector plates for the proton/anti-proton collision experiment at Fermilab, hearing aids, dart boards, score boards, tachs, timing lights, oscilloscopes, and so forth. I took a break from designing and moved to Nashville in the mid-1990's to try to generate interest in my tube amp designs and ended up with modified amps used by Shania Twain, Garth Brooks, Marty Stuart, Patty Loveless, Vince Gill, and others. While I was in Nashville, I was contacted by Gibson to do some consulting on the Orange amps. This led to doing warranty repair work and eventually being sold the parts for the Gibson GB-440 amps when they were no longer under warranty obligations from Gibson. I moved back to Chicago in 1997 right after publishing Dave Funk's Tube Amp Workbook and went back to designing cell phones, cellular base stations, MRI's, and the supercomputers used in the F-22 Raptor and F-35 Joint Strike Fighter planes. After September 11, the economy slowed down, and the military budgets were reassigned to soldiers and bombs which left me to deal with the inventory of parts I had left over from Gibson. My wife and I had assembled some of these Gibson amps, and while testing them, I became critical of their tone which led to a series of modifications that created a new series of amps - the Thunderfunk TFB420's, TFB550's, TFB550-B's, and the new TFB750-A's. How would you define the sound produced by a Thunderfunk amp? Natural, focused, clear, and coherent. That's the goal. I test my amps by playing CDs through them using a pair of EV near field monitors. It allows me to quickly listen to things like the vocals, cymbals, snare, kick drum, and bass guitar. Vocals need to sound natural. The cymbals and the snares reveal high frequency detail. The bass guitar and kick drum produce the percussive punch and low end smoothness. What makes a Thunderfunk amp unique from the amps built by other manufacturers? I don't think other companies really listen to their amps, or they don't know what to listen for, or how to fix it when they hear it. After 30 years of listening to amps on the bench and making modifications, I can quickly listen to another manufacturer's amp and point out its weaknesses. It might also be that other companies are run by business people who hire engineers that are directed by a committee with a price point as a design target. I don't doubt that the large companies know what they're doing. The market is at the bottom. If they can reduce their costs while holding prices, they can make a larger profit. I'd also like to mention offshore manufacturing. It's easy to think that our equipment is being made overseas. However, the fact is that things are made in China for the entire world market, and some of it happens to be sold here. A big reason why it's hard for American-made products to match foreign costs is because here we tax productivity. We expect foreign countries to pay our income tax and social security embedded in the cost of our goods. Until we convert to a consumption tax, which is usually called the "fair tax," things will be difficult for us. Can you outline the primary differences between the new TFB750-A and it's predecessor, the TFB550-B? The TFB750-A still sounds like the TFB550-B but so much better. First, we extended the power. Our original transformer company told us we couldn't go bigger without going taller so we changed to a new transformer company who asked, "how big do you want it?" We were able to increase the gauge of both the primary and secondary resulting in a larger, quieter, and more efficient transformer. It became a Zen-like thing with the voltage and current ratios coming into balance and creating an amp that just breathes with tremendous girth to the notes. We also made some small changes such as going to a thicker bottom chassis. The TFB750-A is slightly taller than the TFB550-B, but it still fits in two rack spaces. This allowed us to go with a larger 80mm fan which is also lighted. Three LEDs light up under power which provides a visible indication that the fan is running as well as a work light for the back of the amp. The fan switch now has two positions, on and automatic. If the fan is set to automatic, why does it need an "on" position, and why doesn't it have an "off" position? The amp now has a thermostat inside that turns the fan on at 140 degrees. This is to avoid the possibility of forgetting to turn the fan on, and it also permits operation without the fan if it isn't needed. The reason for the "on" position is to allow you to pump room temperature air into the amp when you first bring it in from a frozen car in order to warm it up before operating it. You don't need to have the amp plugged into a speaker. To warm up the amp, just turn it on, and don't play through it for a few minutes. This will greatly reduce the thermal stress on the power transistors coming from a frozen condition. The "on" position also provides a way to turn the fan on if you need the work light when the amp isn't hot. 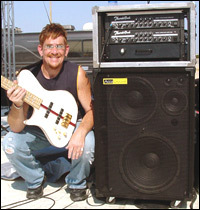 I recently saw bassist Keith Horne use the TFB750-A with his AccuGroove El Whappo speaker cabinet, and it was perfection. I can't imagine that you could make a better sounding rig. With regard to tonal options, what do the enhance and timbre controls offer? The enhance control boosts the high end grit and provides more definition to the amp. I consider a normal setting for this control to be between the 3 and 4 o'clock positions. The timbre control is a see-saw filter that boosts the highs as it cuts the lows and vice-versa. You might say that turning the timbre control completely to the left is a Jazz bass setting while full right is a Rickenbacker setting. Do you think it is more important to have a limiter on an amp instead of a compressor? That is a really tough question. The built-in limiter on a Thunderfunk amp is a very well received device and satisfies most players, but there are so many other great dynamic processors out there that you might enjoy using like a dBX set to a soft knee. That can always be added to the effects loop where a compressor is supposed to be placed, pre-EQ. Could you explain the design concept of "the switch?" This was an accidental discovery. The original AMP BH-420 amp got the low voltage for the preamp circuit from the power amp's high voltage supply by dropping a lot of voltage through large power resistors. I thought it would be better if I added a dedicated low voltage supply for the preamp. This removed an upper midrange honk that the amp had and I preferred. After some consideration, I realized that some slap and double bass players preferred the cleaner, smoother upper range that the low voltage supply provided. This meant adding a "switch" to select which supply to use. The "Tube" position is the original high voltage supply while the "SS" position is the smoother sounding, low voltage supply. The difference between the two is not dramatic, but at higher volumes, the "Tube" position has more interaction between the power amp and the preamp which produces a more pronounced effect. Since the TFB750-A has so many different tone-shaping controls including 4 pairs of semi-parametric eq adjustment, where should a bassist begin when it comes to configuring the amp for optimal output? The quickest way to setup the amp is to position all of the controls at their 12 o'clock detents. Turn the timbre control to the left until you are happy with the low end, and then rotate the enhance control to the right until you are happy with the high end. Usually, you are done at that point. Is it difficult to faithfully reproduce the total spectrum of an electric bass guitar's tonal capabilities without adding coloration? It's not difficult. It's just a matter of using good design practice. I make the design decisions, not some committee. It's a natural business practice to reduce costs, and when you have someone in purchasing changing part numbers because they found something cheaper, you start a deterioration of tone. A few years ago, I made a comment in a guitar magazine about how silver mica caps sound better than ceramic discs. Someone posted on the internet that I was crazy because he couldn't hear the difference. Put that guy in charge of purchasing and you have a spoiler. Have you ever considered developing a series of speaker cabinets that would complement your amp? Yes. We are working on some ideas to increase the efficiency of a cabinet while reducing the weight beyond using neo speakers. Can Thunderfunk amps be purchased directly from you or do customers need to seek out an authorized dealer? We've always sold amps directly as the only way to establish a new, small company. At first, it was very difficult to gain any traction without a dealer network because dealers want things that have large advertising budgets which are out of reach to a small startup company. This changed around 1995 with the world wide web. The internet has been around for a long time, but the graphic interface provided by the web made it easy to publish full color advertising that was accessible on anyone's computer. Add strong word of mouth response, and you have the launch of a successful company without a large advertising budget. We still do very little advertising and sell mostly on the recommendation of other players. That being said, there is still a large group of customers who won't buy anything without trying it in person. This is where our dealers come in. We pick our dealers carefully and are mostly interested in dedicated bass guitar stores which also happen to be a profitable market segment. The Thunderfunk TFB750-A bass amplifier is the direct descendent of the amp that Jaco Pastorius loved, the legendary AMP BH-420, improved and handmade in the U.S.A. by Dave Funk. The TFB750-A's tone is achieved by using high quality film caps in the preamp's signal chain just like a high quality mixing board. Twenty-five times more expensive than electrolytics used in other amps, film cap's tighter tolerances maintain phase coherence through the amp, producing a focused punch unlike any other amp. Add two to three times the filter caps of other amps and you get a round, focused bottom that doesn't roll around the stage but instead projects out into the room. Through a unique "SS/Tube Switch" which changes between the original high voltage power supply that feeds the power amp and a separate low voltage power supply, you'll be able to choose from a super clean, hi-fi solid-state tone for slap and double bass playing to a warm, tube tone for all the rest.